Even before virtual reality saw its recent rise in gaming, players were dreaming about playing games like The Elder Scrolls V: Skyrim in a more immersive way. After all, many spent days exploring these virtual worlds, so imagine what it’d be like if you felt like you were truly in that universe. Thanks to The Elder Scrolls V: Skyrim VR , which releases this Friday, November 17, players no longer have to imagine it. To learn more about the incredibly exciting PlayStation VR title, and quite possibly the killer app for the hardware, we talked to Bethesda Game Studios’ Lead Producer Andrew Scharf about Skyrim VR. He was gracious enough to talk to us about design challenges, the enhancements of virtual reality, and much more. PlayStation LifeStyle: Skyrim is an absolutely massive game that players will spend dozens, if not hundreds, of hours in. Most people don’t play VR for long periods, though. Was that ever a worry internally? Andrew Scharf: That hasn’t been a worry for us. Skyrim has always been a game that is meant to be played however you like, and immersing yourself in that world, in virtual reality, has always been a dream of ours. Playtime varies, but we allow for different playstyles using the PlayStation Move or DualShock controller, if you want to sit on the couch and play for an extended period of time. A lot of the best VR games have been built from the ground up, but there have been great adaptations from already release games (such as Rez Infinite). What challenges popped up while taking Skyrim into the virtual reality realm? We’re working with a great team at Escalation Studios, who are among the best VR developers in the industry, and with their help, we were able to not only get the game running smoothly, but also redesign and reshape Skyrim‘s mechanics to feel good in VR. Comfort is a major concern for a lot of VR players. How much testing went into making sure that players had a wide array of movement and comfortability options at their disposal so they don’t get motion sick? There’s a good number of us here who spend a lot of time playing VR games to see what works well and what doesn’t, but ultimately for developing Skyrim VR, it came down to figuring out the best approach for us. 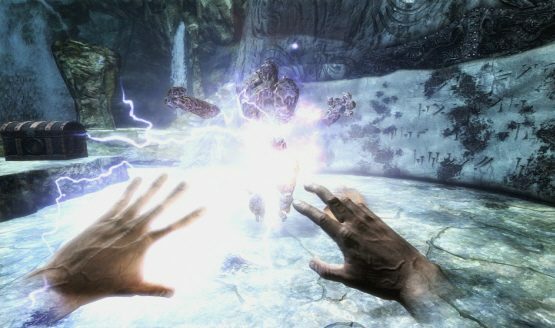 There were unique challenges with Skyrim that we had to iterate on, from having both main and offhand weapons, the design of the PlayStation Move controllers, long-term play comfort, and ultimately, making sure you can still play Skyrim in whichever playstyle you prefer. Through a combination of internal focus testing, feedback from demos, and with guidance from Sony’s VR developer support, we were able to offer several options for players to customize the Skyrim VR experience to their comfort level. Skyrim VR allows players to experience a familiar location, but in a new way. What moments have had the most impact due to now taking place within virtual reality? Truly, the most immediate impact is experiencing the sheer size and scale of the world. The first time you see the vast size of a dungeon like Bleak Falls Barrow in VR, or the towering scale of Skyhaven Temple, or the first time you walk into the world outside of Helgen and see the rolling clouds, blue skies, and rich forests – it really hits you. There’s so much to look at, I sometimes forget to use the World Map to fast travel because I’m just chasing down a deer with a bow and arrow. Of course, there’s the very first moment you encounter a dragon. It was hard not to flinch when the dragon landed right next to me, but I instinctively put the shield in front of me right as fire started heading in my direction – it was a really cool moment. Skyrim has been released a number of times at this point. A lot of people will be wondering if VR is enough to truly freshen the experience. Do you believe it offers up something new and worthwhile, even to Skyrim veterans that spent hundreds of hours within that world already? 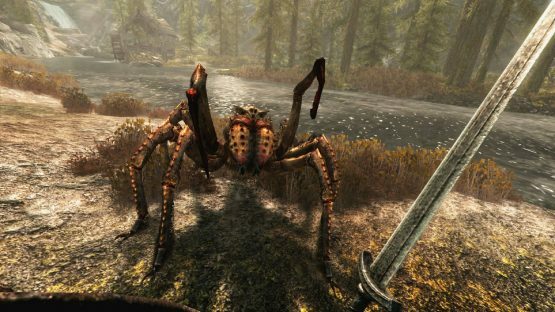 The world of Skyrim is familiar to some, but from personal experience and spending time watching experienced Skyrim players who have spent hundreds of hours in the world, your perspective while playing the game changes dramatically in VR. The scale of everything matters so much more – you look over a ledge at the top of a mountain, or diving deep into one of the many dungeons, you feel like you’re really living inside this world which makes your experience feel more like a unique, personal adventure. For the longest time the dream of a lot of gamers has been having a game like Skyrim in virtual reality. How does it feel to be making what previously looked like a pipedream a reality? It feels both unreal and exciting! VR is something the studio has been exploring for a long time. VR felt like the next logical step for our already immersive worlds, where we have this technology that can allow players to feel completely immersed, and games such as Skyrim and Fallout are perfect fits. Once we put the headset on and looked around Skyrim‘s landscape at scale, it was a no brainer. We had to do it, we wanted to play this game in VR just as much as our fans! We’re thrilled to have been able to make this a reality and provide a way to spend hundreds of hours in a world that we (and our fans) love, in a whole new way. How much does the gameplay differ between playing Skyrim VR with the PlayStation Move controllers and a DualShock 4? We’ve found that using the DualShock versus the PlayStation Move Controllers translates to different play styles that work best for each. Some of the major advantages of using the PlayStation Move Controllers are that you have the ability to nock and fire arrows quickly and accurately, lean around corners and use stealth to see targets, fire two different spells simultaneously at separate targets (an ability that players couldn’t previously do in the original version of the game), precisely control where you pick up and drop objects, and in general be able to interact with the world a little more naturally. We’d like to thank both Bethesda Game Studios and Andrew Scharf for taking the time to answer our The Elder Scrolls V: Skyrim VR questions. PlayStation VR owners will get to explore the epic role-playing game come Friday, November 17. A bundle with a PlayStation VR headset will also be available.